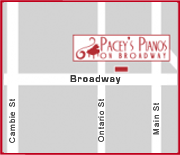 Many people do not realize that Steinway and Mason & Hamlin have shared much in their history. Not only are Steinway and Mason & Hamlin are last surviving companies of the hundreds that once populated American shores, but they represent two of the three pianos still being built there. Coming from this era, they both have a booming, full and well rounded sound that the American instruments are known for. Their scales offer a complete dynamic range and their playability is unsurpassed for technical and pleasurable merit. More than just defined by their generation, many people are unaware that they share a common patriarch: Richard Gertz. Richard was an undeniable genius when it came to piano construction. Richard was born and raised in Germany to a family of music lovers and performers. His father sold pianos in their home town of Hanover. After finishing his studies, he was invited to work at the Steinway factory in New York and contributed greatly to their scale, construction and aura. Richard later worked for several factories and after returning to Germany, was recruited by Mason & Hamlin to redesign their scales. Understanding what a master he was, they offered him a shareholder position and he went to work creating some of the most innovative improvements piano construction had ever seen. Richard Gertz is responsible for much of what defines the modern Mason & Hamlin piano: the crown retention system, the aliquots, and profound scale. When comparing top-tier pianos there are many subtleties and great differences in tone, action, and feel. Much of this is dependent on the tastes and preferences of the player and the role the piano plays in the home. Both Mason & Hamlin and Steinway boast being the highest calibre with long histories, tremendous playability, and heirloom-class longevity. Many say that the Mason & Hamlin, with its technical innovations such as the crown retention system, tunable aliquots, composite action, and extra-heavy duty construction are even superior to the Steinway. While both products compete at comparable levels of quality, there is one area where the Steinway piano is the clear winner: Marketing. Steinway is one of the few names that is universally known outside of the piano world and their reputation of quality and performance is undeniable – but this brand recognition comes at a cost. Steinway is publicly traded and in addition to a heavy marketing budget, they are inevitably driven by profit. Mason & Hamlin, on the other hand, is privately owned by the Burgett brothers and operated independently under the careful guidance of a master piano builder. Purity and dedication to crafting beautiful instruments are the driving forces. Mason & Hamlin is the piano player’s piano. It is for the discerning person who is not caught up by advertising and brand. It also comes at a significantly lower price point than the Steinway for a comparable model. Below are some basic comparisons of the Steinway and Mason & Hamlin pianos. As with any instrument, to truly appreciate the sound and the experience you have to play them for yourself. Get to know them and understand them – whether Steinway or Mason & Hamlin, this instrument will be a part of your family for generations to come. Weight: 750 lbs. 560 lbs. Weight: 860 lbs. 560 lbs. Weight: 900 lbs. 695 lbs. Weight: 1020 lbs. 760 lbs. Weight: 1500 lbs. 990 lbs.